Sardines get a bad rap, but they're actually delicious and nutritious! Find out why you should be eating them, then try one these simple sardine recipes. Blueberries and quinoa, flaxseeds and kale, spirulina, sprouts, spinach, Swiss chard, and sweet potatoes: These are some of the things that come to mind when you think "superfoods." But let us not forget one of the most underrated superfoods of all: the humble sardine. Yes, those little fish that your grandpa used to extract from the can, slap onto a piece of rye cracker, and gobble down—maybe with a vodka chaser. Whether packed in olive oil or fresh off the boat, sardines are perhaps one of the best fitness foods around. Not only are these small, silvery fish inexpensive and low in potentially dangerous contaminants like mercury, but they also have a nutritional resume that will do wonders for your health and physique. Here are three reasons why you definitely don't want to toss them overboard, and a few recipes to help you discover just how tasty they can be. One major reason why sardines are so mega-healthy is their boatload of essential omega-3 fatty acids. The Academy of Nutrition and Dietetics advises consuming two servings of fatty fish a week, providing an average of 0.5 grams of omega-3s a day. 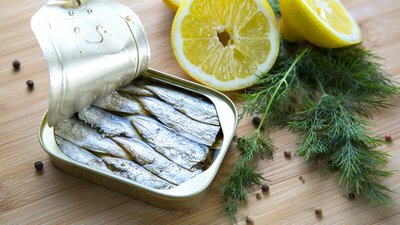 A 3-ounce tin of canned sardines harbors about 1.5 grams of omega-3 fats, so they're a convenient way to get what you need. Why all the omega-3 hype? Sardines contain the omega-3 fatty acids EPA and DHA. A report in the Journal of Dietary Supplements suggests that these fish fats may help improve muscle soreness after a bout of weight training. [2,3] They can also reduce inflammation, lower blood pressure, and improve heart health. As with other gifts from the sea, sardines are a protein heavyweight. One 3-4-ounce tin provides 14-24 grams of protein, which is comparable to the 18 grams in a 3-ounce chicken breast. Not to be overlooked is the role that protein plays in slaying hunger pangs, which can keep you from snacking between meals. Adding to this little fish's superlatives are its bounty of must-have vitamins and minerals. These include hard-to-get vitamin D, phosphorus, selenium, iron, and niacin. Each tin of sardines supplies more than the daily requirement of B-12, which you need for a healthy nervous system. And if you choose sardines that still contain their perfectly edible softened bones, you'll get about 35 percent of your daily calcium needs too. Here are some of the sardine recipes I use when fishing for compliments in the kitchen. This is a great recipe for sardine newbies, since the tang of the mayo and the smoky spiciness of paprika help subdue the fishy flavor. Spread the pâté on rye crackers, rye bread, toasted English muffins, or thick slices of cucumber. Or wrap up a bit of it in fresh lettuce leaves for high-protein, low-carb wraps. Bake up a batch of these omega-rich egg cakes and you'll have meals in a hurry for the next few days. They can be served at room temperature or after a few seconds in the microwave. Serve with a salad and roasted sweet potatoes or a cooked whole grain like quinoa. Toss together these ingredients on a Sunday afternoon and you'll be set for a week's worth of lunches that are much more inspiring than turkey and cheese sandwiches. Or use the pasta salad for a quick meal after a hard workout, since it provides a good balance of recovery nutrients. Kris-Etherton, P. M., Innis, S., & Ammerican, D. A. (2007). Position of the American Dietetic Association and Dietitians of Canada: dietary fatty acids. Journal of the American Dietetic Association, 107(9), 1599-1611. Minihane, A. M., Armah, C. K., Miles, E. A., Madden, J. M., Clark, A. B., Caslake, M. J., ... & Mathers, J. C. (2016). Consumption of fish oil providing amounts of eicosapentaenoic acid and docosahexaenoic acid that can be obtained from the diet reduces blood pressure in adults with systolic hypertension: a retrospective analysis. The Journal of Nutrition, 146(3), 516-523. Tinsley, G. M., Gann, J. J., Huber, S. R., Andre, T. L., La Bounty, P. M., Bowden, R. G., ... & Grandjean, P. W. (2017). Effects of fish oil supplementation on postresistance exercise muscle soreness. Journal of Dietary Supplements, 14(1), 89-100.